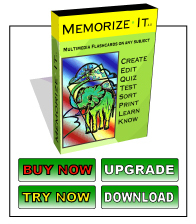 The first version of Memorize-It that I wrote only had Honor System flashcards. Since that time, we have added multiple choice, true-false and type-in cards, but in most cases I still like the Honor system cards the best. Memorize-It keeps track of the hardest cards and allows you to focus on exactly the information that is tough for you. The Honor System card requires that you tell the computer whether you answered the card correctly or incorrectly. This is no different than when my dad created multiplication table flashcards (paper, when I was a kid) and helped me learn those by wrote. We had two piles, those that I got right and those that I got wrong. We continued using the pile that I got wrong until there were none left. The next night we would do the same thing over. This is the same thing you can do with Memorize-It, except that you don't need two people as the computer automates the process for you. Using the computer allows a number of added features which are far superior to the old method my dad and I used, but at the core is still the Honor System flashcard.